There are three notable articles in the latest January 2018 Digital Edition of Shooting Sports USA Magazine. F-Class competitors will definitely want to read the report on the 2017 World Championships. 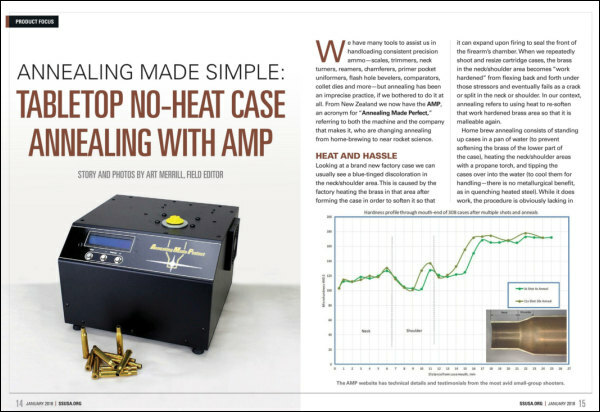 And hand-loaders will appreciate the insightful article on the AMP induction annealing machine. The third recommended article provides tips and techniques for sighting in hunting, tactical, and benchrest rifles. Access the entire SSUSA 54-page January 2018 eZine by clicking THIS LINK. 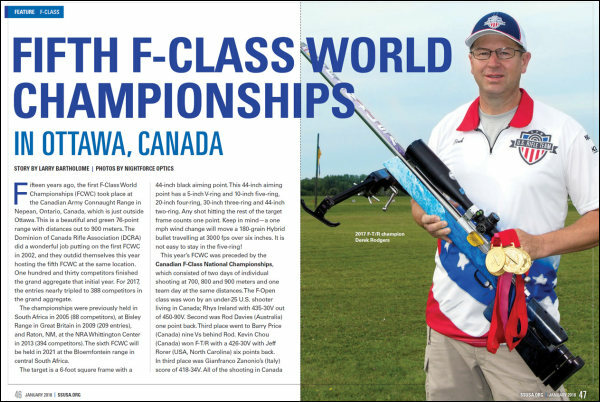 Fifteen years ago, the very first F-Class World Championships were held in Canada. In 2017, the Championships returned to Canada for the fifth edition of the match. This year there were triple the number of entries, representing the growing popularity of F-Class competition. Notably, this year’s event was preceded by the Canadian F-Class National Championships. This issue contains a full report on the event, written by Larry Bartolome, a past National F-Open Champion. Shown at right above is the new F-TR World Champion, our friend Derek Rodgers from New Mexico. Produced in New Zealand, the AMP (Annealing Made Perfect) unit is a sophisticated, microprocessor-controlled annealing machine that achieves ultra-consistent results using an electrical INDUCTION process. By contrast, with butane torch systems you may have to adjust the system when the ambient temperature changes, or even if your butane fuel is slightly different. In this month’s issue of Shooting Sports USA, Field Editor Art Merrill uses the AMP to anneal .30-06 brass for vintage military rifles. The review shows how to use the AMP and explains the advantages of the Induction Annealing vs. flame-based annealing. 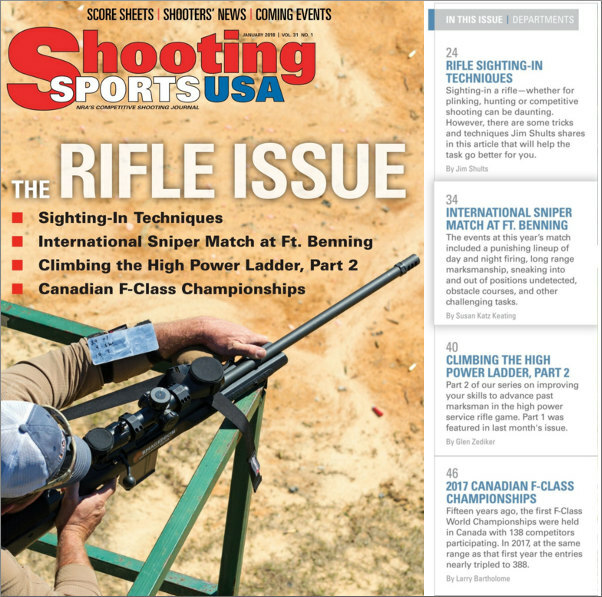 This month’s “Rifle Issue” of Shooting Sports USA focuses on rifle shooting in various forms. Author Jim Shults has written an lengthy article offering tips and techniques for sighting-in your rifle. Shults says “The trick in effective sighting-in (zeroing) is shot-to-shot consistency”. To achieve that consistency, you must first eliminate driver error. You need a stable set-up. Good ammo is also essential and Shults offers an important tip: “Keep your ammo cool and out of direct sun at the range”. Shults also explains there is a big difference between load testing and zeroing. You want to finalize your zero AFTER you have developed your match or hunting load. 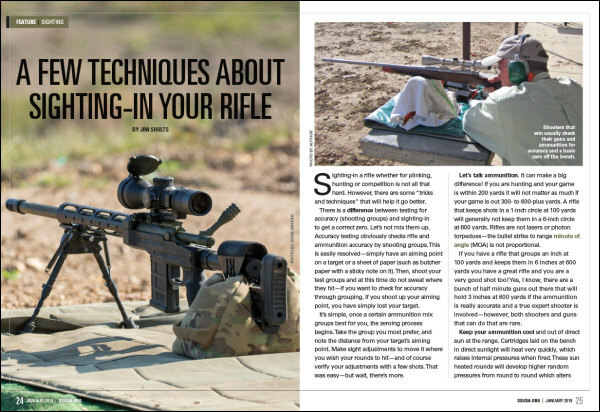 Share the post "Good Reading — Shooting Sports USA January “Rifle Issue”"